Fascia and gutter cleaning is an annual chore for home owners which is often overlooked until the gutter overflows. For many home owners this is a chore they cannot do, they either don't have the high reach ladders, feel unsafe at heights or simply do not have the time. ECO Window Cleaning has the technology for safety; the professionalism for clean gutters and the friendliness to show you the results so you can check the gutters are clear. The Sky-Vac™ gutter cleaning system used by ECO Window Cleaning is the safest way to clean high level guttering, this also avoids the need of having to use ladders. The Sky Vac™ gutter cleaning system is operated from the ground using very lightweight carbon fibre poles that can reach up to 65ft high. 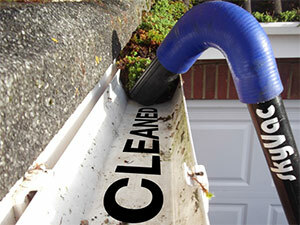 The gutter cleaning system incorporates a guided camera operated from ground level. We can show our clients the blocked part of their guttering without having to climb up to the heights of the guttering. No mess - gutters are vacuumed using an industrial high powered wet and dry system. No expensive access equipment required that keeps costs down. Safe to use and less likely to cause damage to guttering. Precision cleaning due to camera view from the ground. If you would like a FREE no obligation quote for gutter cleaning in the Southport area including Liverpool, please contact us.